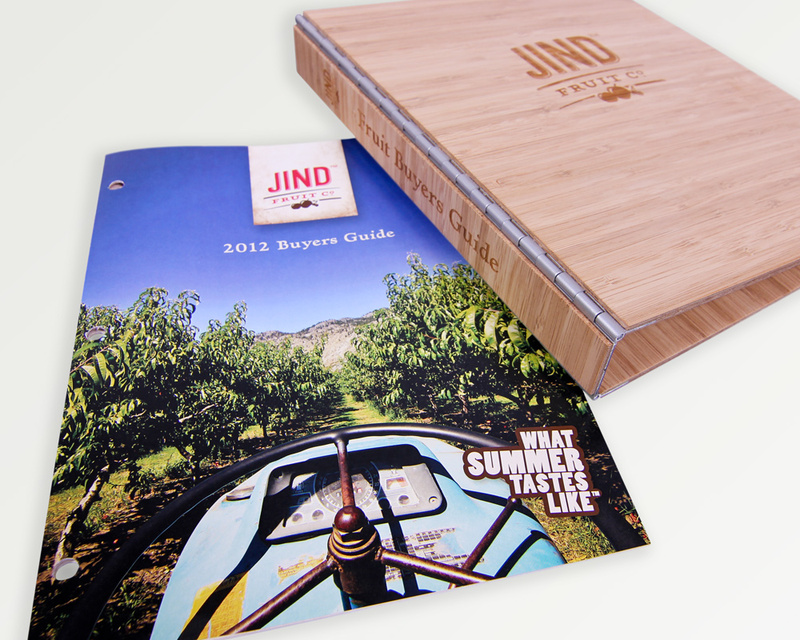 This buyer’s guide for Jind Fruit Co. tightly incorporates their sub-brand visual elements, really cementing the company’s ‘What Summer Tastes Like‘ tagline to the look and feel of all their promotional materials from the website through to the packaging and print collateral. 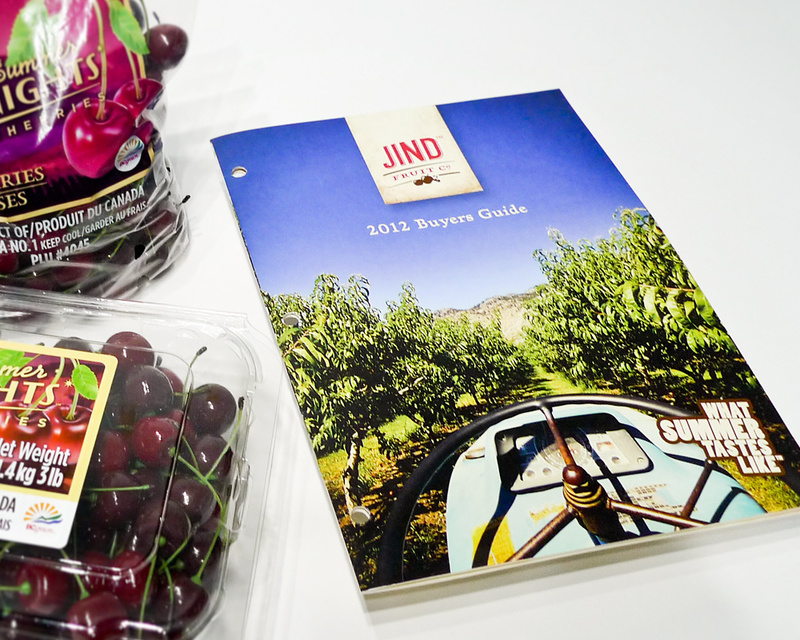 In a very short time, Jind Fruit Co. has become the largest independent fruit grower in BC’s interior, including its Summer Nights™ Cherries, Summer Love™ Peaches, Summer Fling™ Select Fruit (nectarines, apricots, Italian prune plums and grapes) and Summer Breeze™ Apples. This spread features all the fruit that comprise the Summer Fling™ Select Fruit; Apricots, Grapes and Italian Prune Plums. The 16-page buyer’s guide is sent to produce purchasers both Canada-wide and beyond. It contains all the vital information a buyer will need when making their purchasing decision such as produce quality descriptions, availability range, shipping configuration (bulk/clamshell), box dimensions, weight, pallet configuration and sizing. The custom made bamboo binder shown with the cover of the buyer’s guide. A custom-made bamboo binder was designed to stand out on the produce purchaser’s shelf, allowing the purchaser to update their resource binder as updated guides come in. 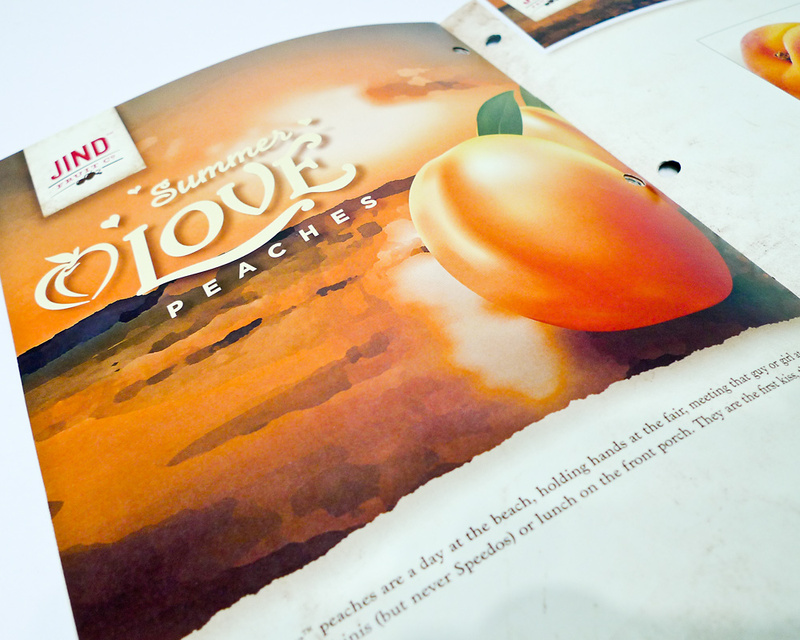 Close up of the Summer Love™ Peaches illustration which also appears on all the packaging. Jind Fruit Co. is a third-generation independent fruit grower in Osoyoos, BC. A spring 2011 re-launch of the reinvigorated brand started Tugboat Group‘s involvement with this innovative brand. See also Jind Fruit Co. Packaging and my First Look at the Jind Fruit packaging (blog post). All work copyright Tugboat Group, Jind Fruit Co., and their respective owners. 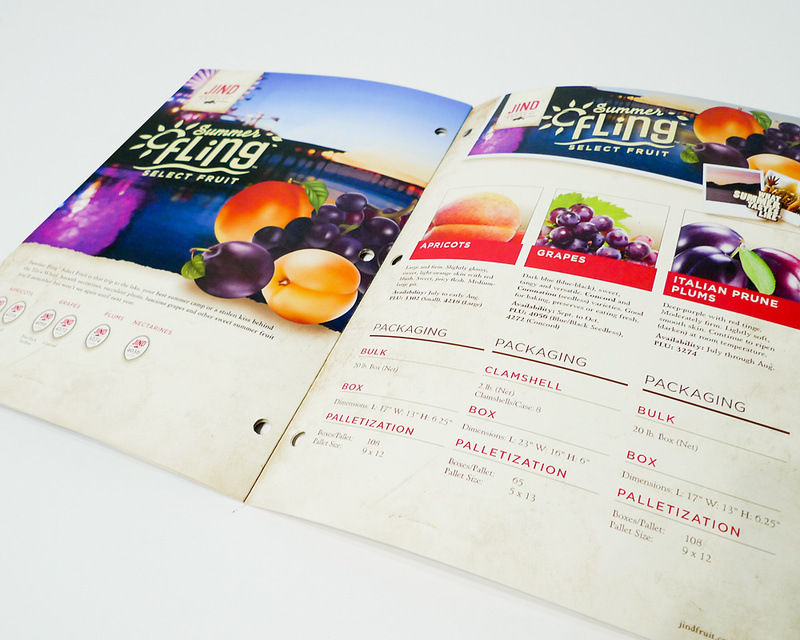 You can view Tugboat Group’s portfolio post for the Jind Fruit Co.’s Buyer Guide here.